On the way out of town after the retreat, I drove around and took photos of some of the places that we visit in Shipshewana, Indiana, while we are at the Dear Jane Retreat. Everything here is closed on Sunday, so the town is eerily quiet. Shipshewana is located in far northern Indiana about 7 miles from the Indiana/Michigan state line. This is the Farmstead Inn where we stay and sew during our retreat. Here is the Visitor's Center. I love the wooden quilts on the building, and it makes me wish I had a barn. This is Rebecca's Arts and Antiques. Rebecca sells antique quilts, unfinished antique quilt tops, quilt blocks, baskets, and lots of other great things. Yoder's has a new electronic sign. Here is the gazebo in front of Yoders where I've spent some nice time visiting with good friends. More wooden quilts. These are on the side of Yoders. Davis Mercantile, the building that houses Lollys, Jo-Jo's Pretzels, Kitchen Cupboard and lots of other interesting shops. One of the Lolly's entrances. In the center is the Garden Gate, also known as The Cupcake Place. I don't know what this is, but I love the building. This is across from the Blue Gate....can't recall the name....but, they always have a nice Christmas display. D'Vine - they have great yarn. An outdoor shop with lots of interesting things for sale. Here are a few photos from show and tell on Friday evening. The room is bright white with lots of lights, so my photos never turn out looking great, but you can still see these wonderful quilts. This is a wedding quilt that Kim was working on. This one is by Judy. 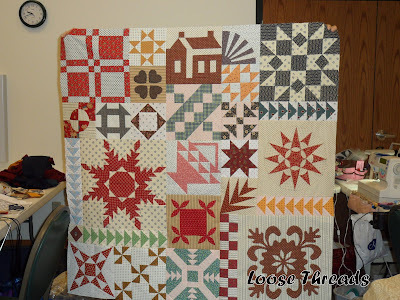 She took Roll Roll Cotton Boll, Bonnie Hunter's mystery quilt from 2010 and added sashing. Very striking. I don't know the maker of this quilt, but the applique' is gorgeous. A beautiful Dear Jane top. This one belongs to Pat. This one is beautiful. Sorry, I don't know the name of the maker. Another finished Jane. Also, do not know the maker. This is an antique quilt purchased by Theresa at Rebecca's Arts and Antiques shop in Shipshewana. This is a part of the Just Takes Two quilt by Donna. I love it done in shirtings and repros. The patterns have been released every two weeks by Brenda and Gay. I know the subject of my post says retreat wrap up, but we had a nice lecture on Civil War quilts one evening. Another evening we had a jelly roll race, and I want to share those in another post. Hello readers and welcome to my stop on the Holiday Lane Blog Hop. I'm excited to show you what I've done with the free Holiday Lane pattern created by Jill at Jillily Studios. Thanks to Madame Samm at Sew We Quilt for sponsoring this blog hop and to Pauline at Quilt-N-Queen blog for being our cheerleader and organizer for this hop. Jill's Holiday Lane pattern is so versatile, and since I love to decorate for Christmas I couldn't wait to sign up for this blog hop. I really had fun with the pattern. As soon as I saw it, I knew I wanted to make it into a table runner for my kitchen. I had some Christmas prints that I wanted to use, so I made the rooftops and shutters from different fabrics than the houses. I hand appliqued' the trees, windows, and all of the snow on the rooftops and embroidered the windowpanes. I really wanted to decorate the houses, but this year I not only have a new grandson, but we have a new cat. And, both of them like to put things in their mouths. So I decided to save all of these goodies and maybe in another year I can use them. I also used two of the houses and made this pillow to cover a 14" pillow form. This was my first venture into piping, and I really like the look. The table runner can also be used as a bed runner along with the pillow to add a touch of Christmas to a bedroom. I could always add a hanging sleeve and my decorations and make my runner into a wall hanging. Thanks Jill for a fun project! I hope you will hop on over to visit the others taking part in today's Holiday Lane Blog Hop. Thanks for stopping by for a visit today!! I have a lot to be thankful for and among those blessings are those of you that stop by to visit my blog. Some of you I have met and others I have gotten to know through email. I'm thankful for each and every one of you. Hello readers. I hope you aren't getting tired of my posts about our Dear Jane Retreat in Shipshewana, Indiana. I'm back home but want to share a few more photos with you. I like posting photos from the retreat for those that weren't able to come this time, for those that have never been there, and for those die hard quilters who sat in the sewing room most of the time and actually sewed! This is the Kitchen Cupboard. It is in the same building as Lolly's Quilt Shop. I go here every day to get a latte'. Jo-Jo's Pretzels. The big attraction here is the pretzels that are made right on the spot. It is just heavenly warm dough. They not only have regular pretzels, but they will coat them with cinnamon and sugar or parmesan cheese. They also have soup and sandwiches, and these pretzels are the best. The Lang Store sells quilts, pretty stationery and figurines among other things. The Cuddle Store in the basement of the Davis Mercantile Building. This shop is full of Cuddle which looks and feels like Minke. The Farmstead Inn where we sleep (a little bit) and sew (sometimes). This is the room we pass through on the way to the sewing room. Another little room at the Farmstead to sit and sew and visit. The Cinnamon Stick over in Middlebury, Indiana. This is the Vera Bradley room. I had never been to Cinnamon Stick before, and it is a cute shop. Everything in town is decorated for Christmas. This is the sewing room. There is some sewing going on, but it looks like most people are out shopping or eating. Here are some photos of Lolly's Quilt Shop where we buy a lot of our fabric during the Dear Jane retreat. This cuddle quilt hangs on the door. This is the Moda section. I love the charm packs that are on the counter. This is just a portion of the Kaffe Fassett & Brandon Mably fabrics. There is some yarn and knitting needles. The display in the wooden case holds fat quarters of fruit and vegetable fabric. On the left is the Civil War section. Straight ahead is more repros and novelties. Straight ahead is just part of the batiks. I don't have photos of the tone on tone fabric room or the flannel room, the Jinny Beyer wall, Christmas fabrics, 30s or oriental fabrics, rulers, tools or books. This is an amazing store with anything you could possibly want for quilting.